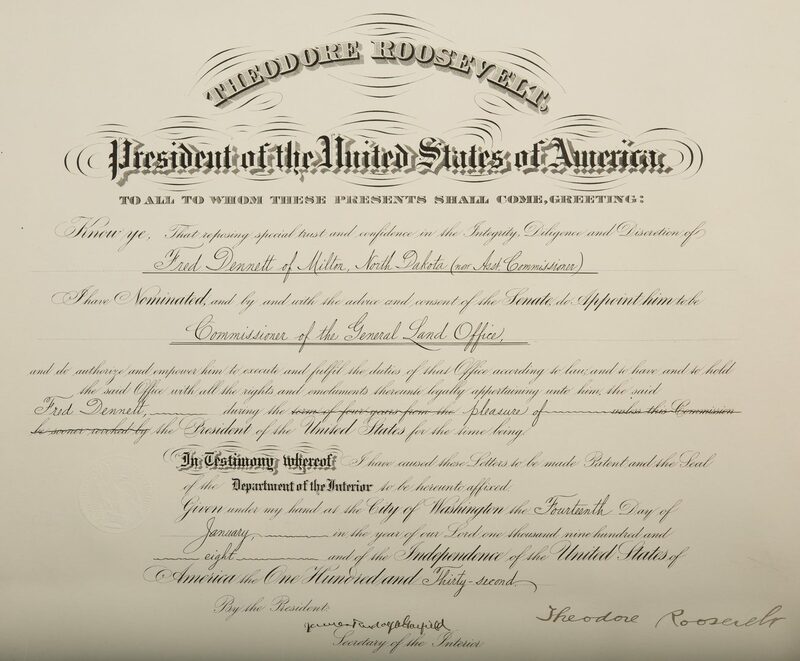 1st item: Presidential appointment document signed by both Theodore Roosevelt and Secretary of the Interior James Rudolph Garfield in black ink, dated January 14th, 1908, conferring the position of Commissioner of the General Land Office to Fred Dennett of Milton, North Dakota, "…to have and to hold the said Office with all rights and emoluments thereunto legally appertaining unto him, the said Fred Dennett during the pleasure of the President of the United States of America for the time being". Crane & Co Dalton Mass 1905 Parchment Deed No. 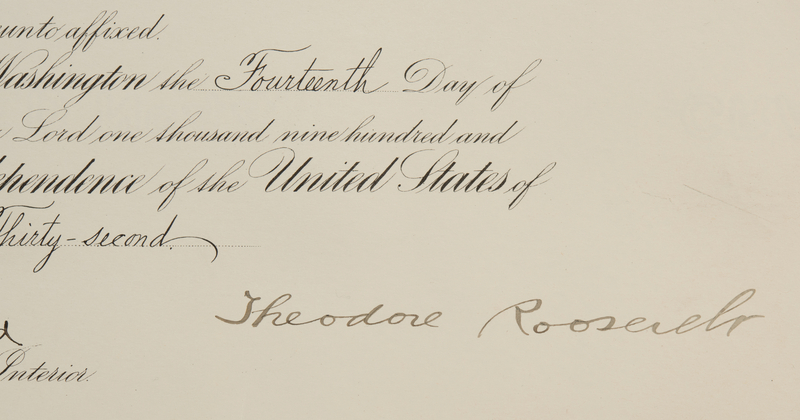 44 watermark, across top, center, and bottom of sheet. 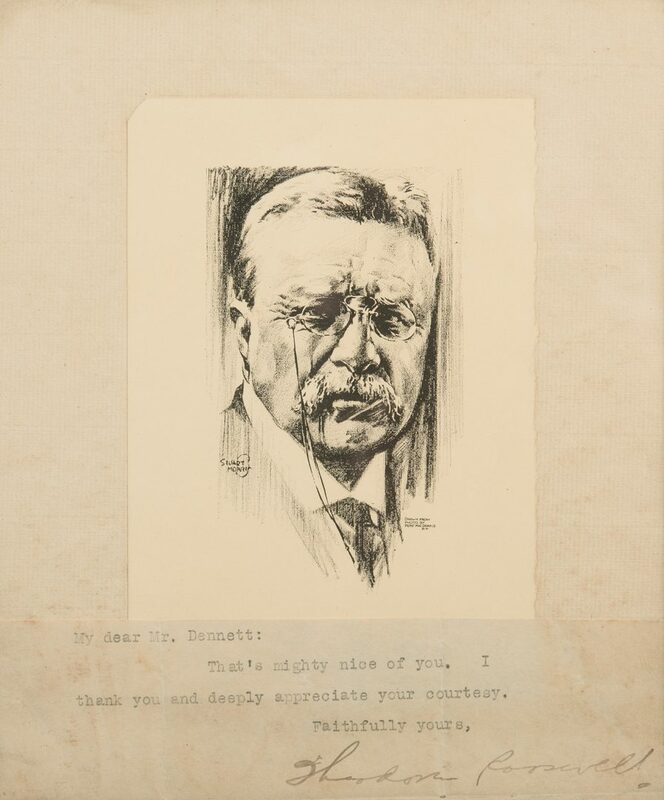 17 1/4" H x 22" W. 2nd item: Letter with Theodore Roosevelt signature (probably secretarial or by his son), reading "My dear Mr. Dennett: That's mighty nice of you. I thank you and deeply appreciate your courtesy. 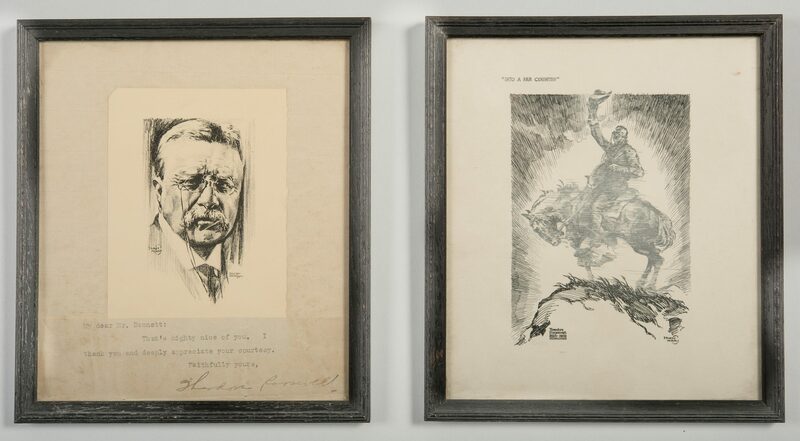 Faithfully yours, Theodore Roosevelt", framed with an etched, bust length portrait of Roosevelt by Stuart Morris (American, late 19th/early 20th century) after a photograph by [Ian Pirie] MacDonald (American, 1867-1942). 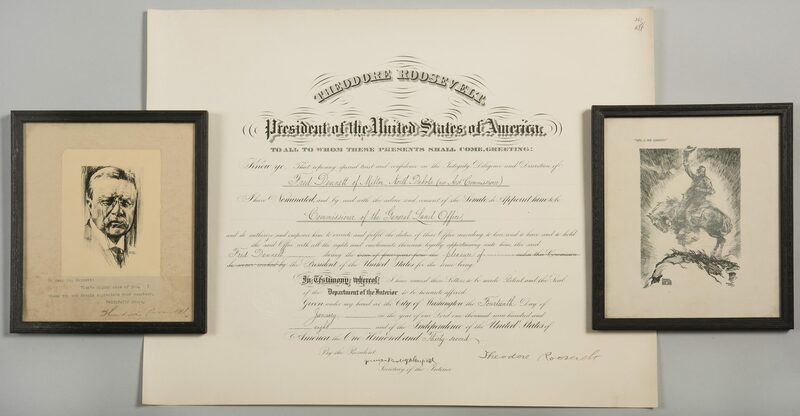 Arlington Hotel label en verso reading "Autographed and presented to Hon Fred Dennett, Commissioner of the United States General Land Office, under President Roosevelt, later Hon Fred Dennett was Commissioner of the U.S. Land Office under President Wm. Howard Taft". Housed in a contemporary wooden frame. 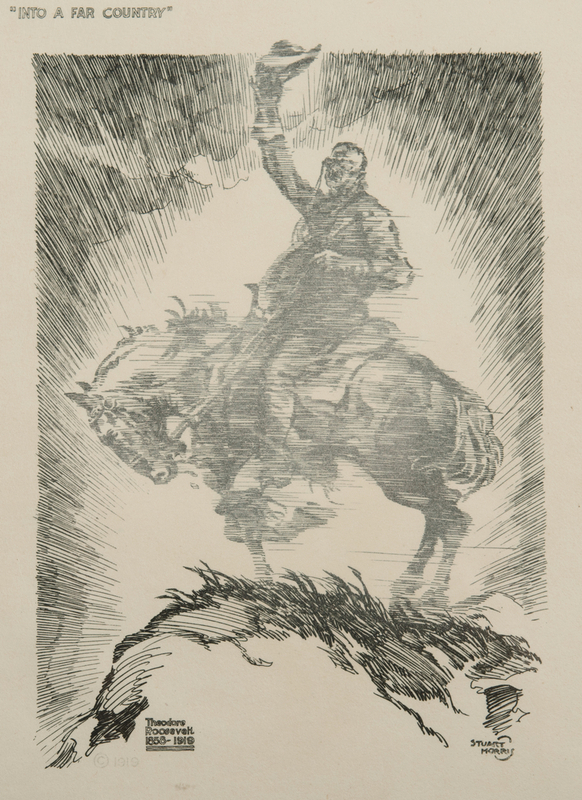 Sight – 8 1/2" H x 7 3/8" W. Framed – 9 5/8" H x 8 1/2 W. 4th item: Stuart Morris etching titled "Into a Far Country" depicting Theodore Roosevelt on a horse with his hat in his right hand. Titled, top left above image, signed, in the stone, lower right, dated 1919 and copyrighted with notation "Theodore Roosevelt 1858-1919", in the image, lower right. Label en verso reading "Presented to Hon Fred Dennett while Commissioner of the U.S. Land Office by President Roosevelt, while he was President" . All items early 20th century. 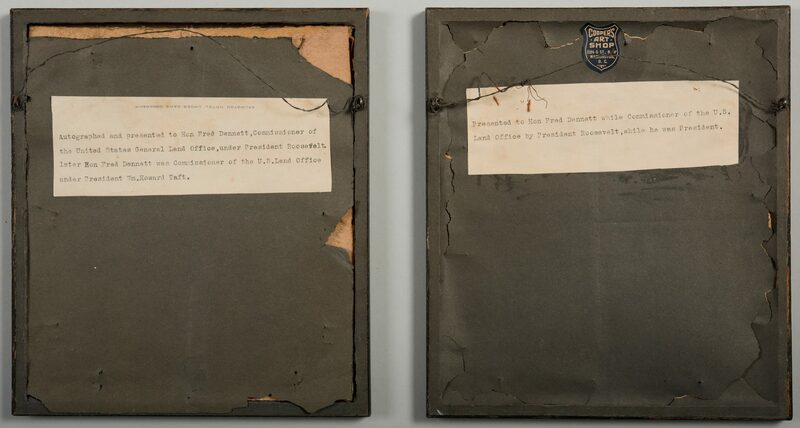 By descent from Fred Dennett, 32nd Commissioner of the General Land Office, 1908-1913. See other related lots in this auction. CONDITION: 1st item: Creases, edges of sheet. 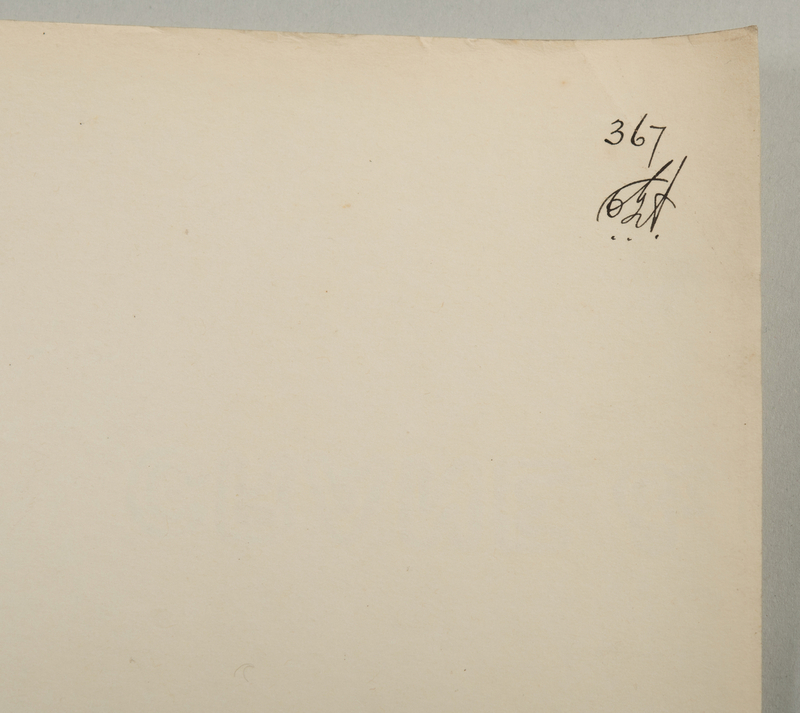 Scuff marks, largest 1", en verso. 2nd item: Foxing, largest spot 1", scattered on surface of sheet. Not examined out of frame. 3rd item: Overall good condition. Not examined out of frame.